Come on this safari trip with Adventour in South Africa where you will be given the best service to let you create the best memories of your adventures. Take the opportunity to enjoy various activities with possible sightings of the big five, leopards, and many other types of animals. Do not miss this amazing chance for a great experience in the wilds! The Kurula Bush Lodge is an experience rather than a destination – it promises to build you a unique bushveld encounter. Situated within the Greater Kruger National Park, Kurula Bush Lodge is unfenced and guarantees a Kruger safari and other private big 5 game reserves and is also the gateway to many scenic wonders of the Mpumalanga Province of South Africa. You will depart Johannesburg early morning from your place of accommodation and make your way through the Lowveld to the Kruger National Park. A quick stop on route for a late breakfast or lunch (on your account) will be enjoyed before continuing. After settling in, you will participate in a sunset open vehicle game drive. Full day game drive activities is on the menu for the day in an open four-by-four game drive vehicle with a local guide. An opportunity for excellent game viewing to sight the big five as well as hundreds of antelopes and bird species exist today. It is not guaranteed that you will see all the big five such as the elusive leopard during the day. Enjoy the morning and afternoon out in Open Game Viewer with a relaxed lunch served at the lodge. After an early morning breakfast and perhaps a last chance to see the Kruger by way of an optional morning bush walk, you will depart and set off on the panorama route via the Gods Window and Three Rondawels. After a quick lunch stop (at your own account), you will continue via Lydenburg and Dulstroom to Johannesburg. You will arrive back in Johannesburg in the late afternoon to be transferred back to your place of accommodation where Adventour will bid you farewell. The location will be at The Kruger National Park which covers 19,500 square kilometers which makes it the second largest game park in Africa and the largest in South Africa. The Kruger National Park spans 360 kilometers from north to south and 65 kilometers from west to east. 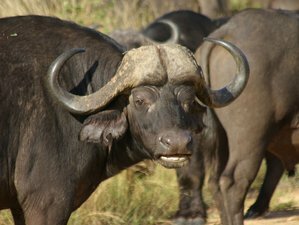 The park holds the big five which is a dream come true to any avid game watcher and wildlife enthusiast. For the avid birdwatchers, this can be simply described as pure heaven. The price of the package includes daily breakfast, lunch and dinner. On the first day, you will only have dinner, while on the last day, you will only get breakfast. In order for Adventour and its travel partners to properly cater you whilst on tour, it is important to inform them at the point of booking should there be any special dietary requirement. After an early morning breakfast, you have a last chance to see the Kruger wildlife by means of an early morning bush walk. Please book your flight to arrive at O. R. Tambo International Airport (JNB). Adventour will collect you from your place of accommodation or at the Airport in Johannesburg. the transfer to our lodge is approximately 5 hours and will arrive just in time for your Sunset Game Drive in the Kruger National Park.